The three-day Study visit to University of Eastern Finland’s campus in Joensuu started in cold weather and heavy snowfall. it was lucky that the colleagues had prepared properly by wearing warm clothes. It was of course their second Study Visit to Finland during the Project, so they knew what could be expected. The programme started with a day devoted to engaging workshops related to the pedagogical use of the forthcoming Smart Learning Rooms. The workshops concerned Personal Learning Environments, gamification and use of web-based tools. The Day Two kicked-off with participants having an opportunity to hear a presentation about the use of robotics in teacher training. The day then continued with more workshops, the team also getting to practice the use of several SLR equipment hands-on. On the third and final day the team sat down to plan for the forthcoming. This time it was to move ahead with the development of the Smart Learning Room training and maintenance materials. After the intense and effective days spent in Joensuu, it was time for the colleagues to move to the train station and continue their journey towards the city of Hämeenlinna, where they would participate in EAPRIL conference. 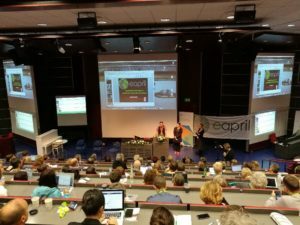 The EAPRIL conference of 2017 was held at the university of Hämeenlinna. 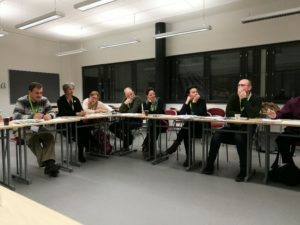 The Erasmus project was discussed with participants during a round table session entitled: Research capacity building with teacher educators in Palestine. This session was chaired by Ellen Rohaan. After an explanation of the aims of the project we zoomed in on WP 5 in which practice-based research (PBR) is used as the main research strategy for research capacity building in this project. Since PBR is still an unfamiliair research model in Palestine, one of the milestones of the work package is the development of a model for PBR in Palestinian teacher education. This model is based upon the standards of PBR by Ros and Vermeulen (2010) and framework by Furlong and Oancea (2005). In the round table session a first draft of the model for PBR in Palestine was presented and we discussed cultural challenges in Palestine and shared experiences about using PBR as a strategy for professional development in international contexts.